When you think about Content Management is important to also think: what’s your company’s information worth? what’s your time worth? Content Management today is more than corralling enterprise data into the right systems—it’s about enriching that data and making it more valuable for your company. That’s why OpenText is presenting OpenText™ Decisiv Search to OpenText™ eDOCS as its default search engine. OpenText Decisiv Search takes the reach and depth of AI-enhanced search even further. It uses unsupervised machine-learning technology to develop a deeper understanding of content, and surface more accurate and comprehensive search results, enabling information to be more rapidly pinpointed, extracted, and leveraged into business advantage. This means that users in legal and professional services firms can spend less time looking for the information they need, and more time doing the work that matters. Content is about much more than mere words; it’s about how words interrelate. 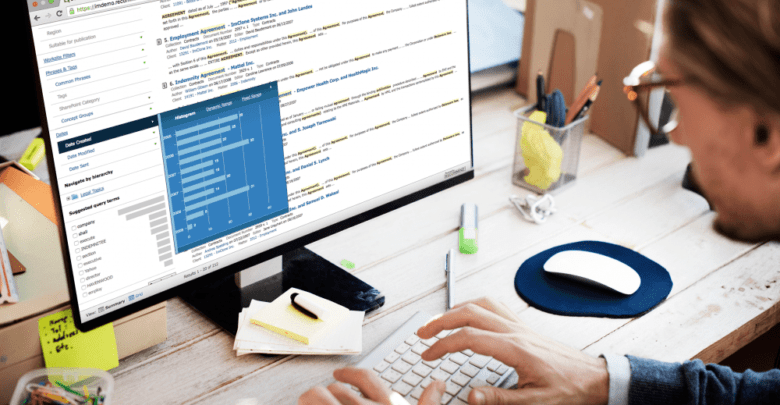 By analyzing the statistical co-occurrence of terms within content, machine learning forms sophisticated models that can take search much further. Decisiv can identify concepts, extract phrases, suggest better queries, and pinpoint internal subject matter experts with relevant expertise—whether or not this knowledge is reflected in their written profiles. Imagine that you’re looking to understand more about your business operations in Asia. Your first instinct might be to search for documents containing “Asia,” but will that term necessarily appear in the most valuable content? For that matter, how many documents will list city, state, country, and/or continent? Without machine learning, you would need an exhaustive search taxonomy to address all these variations. When a Decisiv user types “asia,” the system instantly and automatically retrieves documents that (1) contain the word Asia and/or (2) are conceptually related to Asia. This not only casts a wider net, it provides results based on a more sophisticated relevancy analysis than simple keyword searching could hope to deliver. Concept grouping categorizes documents according to linguistic patterns that we humans have a hard time identifying across large volumes of data. Machine learning makes such conceptual analysis automatic and highly scalable, and humans get the benefit. With businesses that provide critical legal and professional services, meaning and context matter greatly. For these businesses, identifying and leveraging—at speed—the content companies are looking for is vital, even when the users themselves are not exactly sure what that is. With Decisiv powering eDOCS search in the DM 2018 release, customers will be able to more quickly and accurately pinpoint relevant work product—regardless of the exact keywords used. eDOCS is helping companies transform their repositories – with the addition of APIs, automation, and the likes of AI – from static storehouses of historical data into strategic sources of information that can be leveraged to accelerate business performance. With this announcement, and the bundling of Decisiv into eDOCS DM as the index and search engine in 2018, companies will be able to quickly extract results from within the firm’s eDOCS library or libraries. For those wishing to extend Decisiv’s capabilities to search Enterprise-wide repositories, the OpenText Decisiv module will continue to be offered as a stand-alone module within the eDOCS suite, as it is today.